New Trent Arcadia Rapiduo: we have covered many New Trent accessories for iPhone and iPad here in the past. 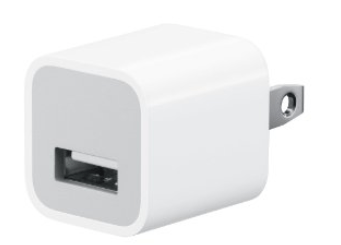 This one has dual ports to charge your iOS devices fast. It has short circuit and overcharge protection. 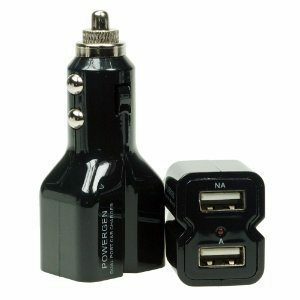 PowerGen Dual USB High Output Car Charger: a compact charger that can handle your iPad, iPhone, HTC, MP3 players, and more. You can use your existing USB charging cables. reVOLT c2 Dual USB Charger: charges your iPhone and iPad. It is tiny and has dual 10 Watt USB ports. reVOLT has smart circuitry so that you won’t fry your iPhone or iPod. 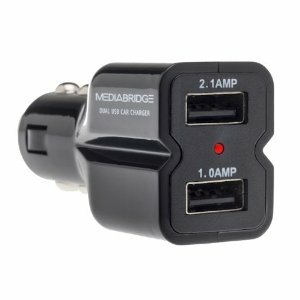 Mediabridge High Output Dual USB Car Charger: compatible with the latest iPhone and iPad. It offers overcharge protection to keep your gadget safe. iFlash High Output 4 USB Car Charger: works for iPad 3, iPhone 4S, Galaxy phones, Kindle Fire, and even your GPS devices. Its LED shows when the charger is working. What’s neat about these chargers is that they are compact and easy to carry around. They simply get the job done.